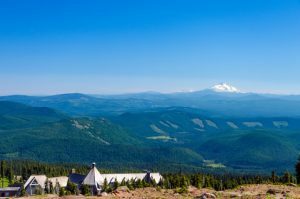 Timberline Lodge & Ski Area in Oregon’s Mt. Hood Territory has been named Official Training Site for the US Ski Team, US Snowboarding and US Freeskiing. Olympic athletes across disciplines, including alpine racing, snowboarding, freestyle and freeskiing, will be traveling from all over the United States and beyond to participate in summer training at Timberline on Mt. Hood. own racing lanes reserved on Palmer as well. Mt. Hood Territory not only offers the best summer skiing and endless outdoor recreation from whitewater rafting on class III and IV rapids to biking a volcano. It is also part of Oregon Wine Country, Wine Enthusiast Magazine’s Wine Region of the Year worldwide and famous for Pinots. Experience The Territory’s wine scene along its Farm Loops, complete with plenty of u-pick farms, lavender and dahlia fields, friendly alpacas and even an on-farm cooking school. While there, you may also explore the last leg of the Oregon Trail, the Barlow Road, all the way to the official end of the Oregon Trail in Oregon City where you’ll even find the 2nd largest waterfall by volume in the U.S. after Niagara, Willamette Falls. Don’t miss unique historical sites and nearby shopping and dining gems along the way by downloading the brand new Mt. Hood Territory Heritage Trail app. From cozy cabins and luxury vacation rentals to historic lodges and hotels with a view, your perfect place to recharge after each day’s adventure in Mt. Hood Territory awaits.